The Georgia Guidestones is a large granite monument in Elbert County, Georgia, USA. A message comprising ten guides is inscribed on the structure in eight modern languages, and a shorter message is inscribed at the top of the structure in four ancient languages' scripts: Babylonian, Classical Greek, Sanskrit, and Egyptian hieroglyphs. 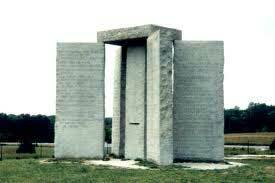 The structure is sometimes referred to as an "American Stonehenge." The monument is almost 20 feet (6.1 m) tall if the buried support stones are included, exactly 18 feet (5.5 m) otherwise, and made from six granite slabs weighing more than 240,000 pounds (110,000 kg) in all. One slab stands in the center, with four arranged around it. A capstone lies on top of the five slabs, which are astronomically aligned. An additional stone tablet, which is set in the ground a short distance to the west of the structure, provides some notes on the history and purpose of the Guidestones.